The energy of Sedona is transformative, introspective, and uplifting all at the same time. Sedona was named after one of its early founders, Sedona Schnebly. She is buried in a small local cemetery which we visit often. During one of our visits, we were inspired to create an essential oil blend that is representative of Sedona, the woman, as well as Sedona, the place. During one of our meditations at her grave site, we received the recipe for what is now Sedona Spirit. There are many wonderful plants and trees that grow here, most year round. We are surrounded by many beautiful conifer trees, especially different species of Juniper. We are so fortunate to be working with an artisan distiller who lives right here in Sedona. Our distiller wild harvests our local plants and trees without the use of machinery, so the vibration and “footprint” of the plant and tree are intact. One of the essential oils in this blend is Utah Juniper, an exquisite Juniper and Sedona Schenbly’s grave is shaded by this magnificent tree. 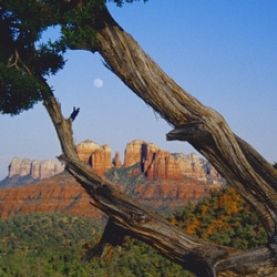 Sedona Spirit is offered in a jojoba blend as well as a stock blend. This blend is supportive, uplifting, protective, and calming. It truly is a representation of Sedona in that it is a bridge to what lies deep inside of our consciousness. This blend was created with three of the plants and trees that are common to the natural environment here in Sedona. Utah Juniper (Juniperus osteosperma) - Assists in grounding one's spirit as well as connection to the earth. Also helps expansiveness and clarity of vision. Promotes a positve self image and strong boundaries. Rosemary (Rosmarinus officinalais ct verbenone) - Wonderful for the memory and clarity of mind. Energizing, both emotionally and physically. Uplifting, yet grounding and emotionally settling at the same time. Lavender (Lavandula angustifolia) - Offers emotional stability and balance. Uplifitng as it quells fears, anger and anxieties. Calming, balancing, and soothing to the emotional body as well as the physical nervous system. Offers comfort, nurturance and softness. Cape Chamomile (Eriocephalus punctulatus) - Powerful anti-stress essential oil. Has the ability to offer sedation without depression or lethargy. Calms and helps transmute feelings of anger. Assists in expressings one's truth with intregrtiy and ease. This blend is a 30% blend in a base of organic jojoba. This is a very concentrated blend and unless used as a perfume can be further diluted in unscented lotion or oil.